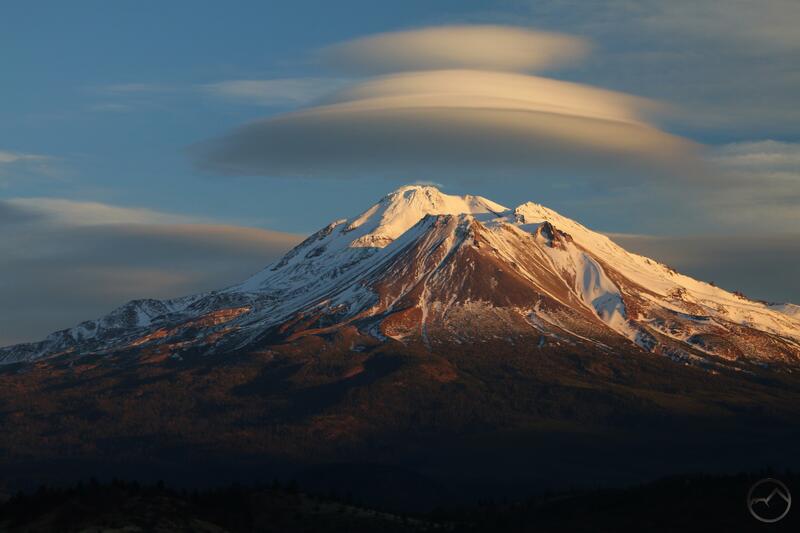 Awesome lenticulars form above Mount Shasta in December2017. 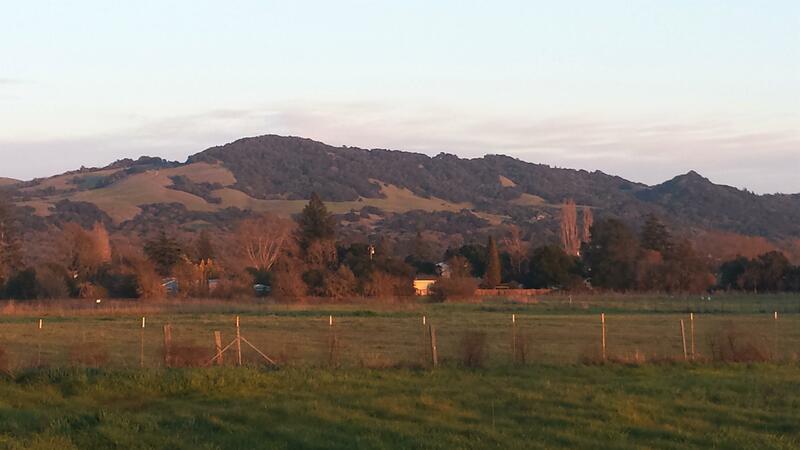 When I gave my presentations down in Sonoma, I included a lengthy Power Point with tons of pictures of the trails in the Wine Country and beyond. After covering the local trails, I transitioned from discussing Napa and Sonoma Counties to introducing Mount Shasta. To do this, I included 13 images of the mountain that had been taken over the previous 9 weeks. It included a stunning array of cloud formations, sunrises and sunsets. Indeed, the last 2.5 months have seen a high concentration of spectacular lenticulars and the wintry conditions (despite the lack of snow down low) have made for some gorgeous scenes as the white mountain was illuminated by the rising and setting sun. Looking back through my collections of previous years images, I have not found a time where I observed a similar number of events. Obviously I have missed many great clouds, sunrises and sunsets, but I maintain that mid-December to the end of February saw an unusually high concentration of photogenic conditions. On top of the incredible sequence of spectacles on Mount Shasta, we were also fortunate to witness a magnificent lunar eclipse. It sure has been a terrific 2.5 months! A very approximate rendering of the area covered by the proposed expansion of the Gateway Trail. On Monday, January 29th, the US Forest Service hosted an informational meeting at the Mount Shasta City Park. The subject of the meeting was the proposed expansion of the Gateway Trail. Located on the southwestern flank of Mount Shasta, the Gateway Trail is an 11 mile network of mixed-use trails that wind through lower elevation areas just outside of Mount Shasta City. 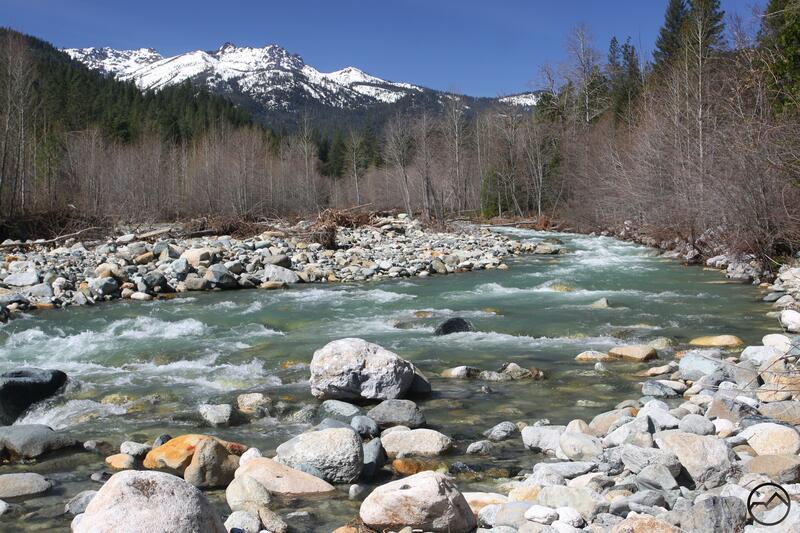 Developed by a collection of different groups that include hikers, mountain bikers and government agencies, the trail system has been a popular addition to the recreational opportunities in the Mount Shasta area. Though it is enjoyed by hikers and other users, the Gateway Trail has been particularly embraced by mountain bikers. Having a multi-season, trail network that offers a series of loop possibilities in beautiful and varied terrain so close to town has begun to put Mount Shasta on the mountain biking map. When completed, the Gateway Trail Phase II expansion will solidify Mount Shasta as a premier mountain biking destination. The expansion is ambitious. In addition to the original 11 miles of existing trails, it will increase the system by 47.5 miles, bringing the total to 58.5 miles. As the miles would indicate, this new phase of development will cover an extensive area on the lower flanks of Mount Shasta. The terrain here is varied. There are creeks and springs, hills and large flat areas, gullies, rock outcroppings, and forests, both natural and plantations. 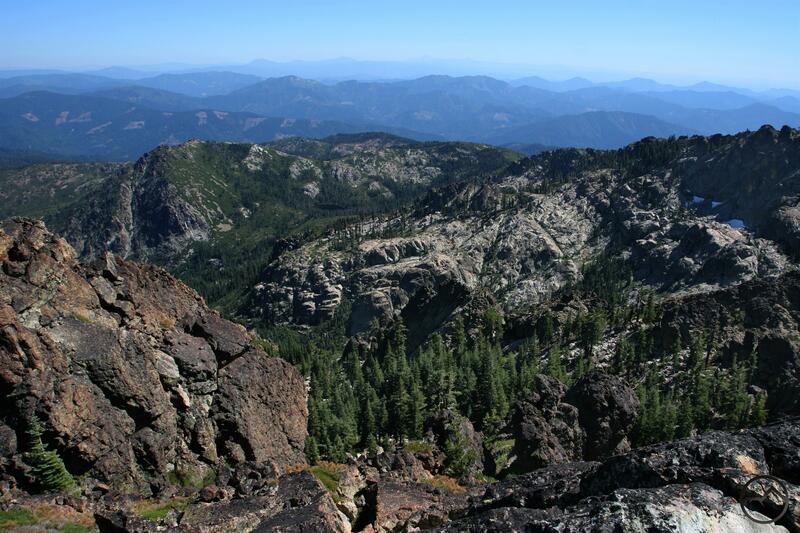 And, any many parts of the trail, there are views that include the upper slopes of Mount Shasta, the Strawberry Valley and the high peaks of the Trinity Divide. In short, the proposed expansion involves beautiful scenery and miles and miles of trail from which to explore it. Existing Gateway area is marked yellow. Phase II expansion area is red. Phase II expansion is ambitious and exciting. The majority of the trails in the expansion will be mixed-use, available for hikers, equestrians and mountain bikers. Though all these groups are welcome, the last is the true target for most of the project. Several trails are included in the proposal to ease flow of bikers in certain loops, provide for multiple levels of biking difficulty and to provide a variety of terrain types. While this particular form of trail use is in primary focus, there are still plenty of opportunities for other users like hikers to get out and enjoy what this new trail system will offer. Existing trails are gold. 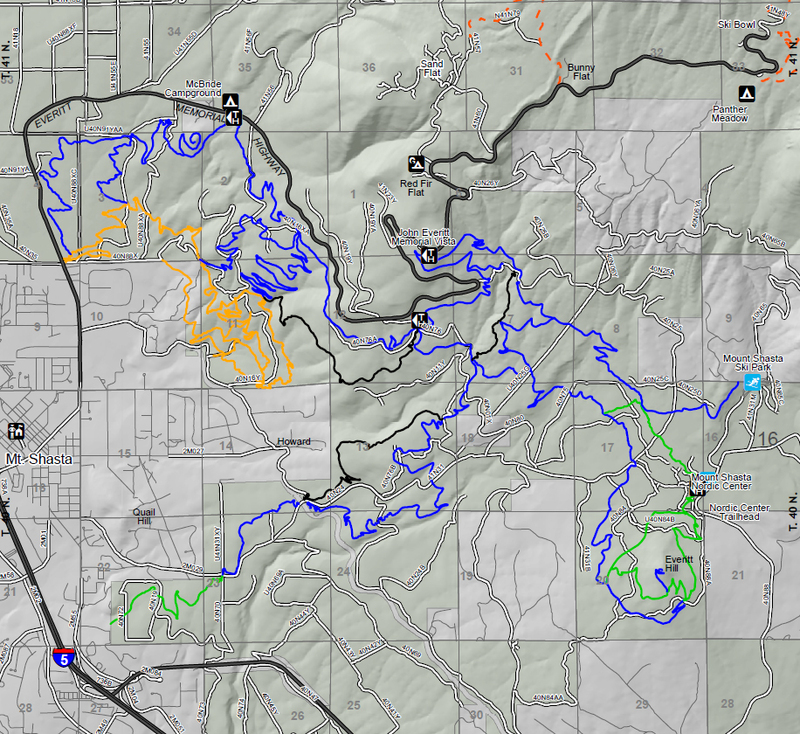 Black, blue and green are proposed trails. 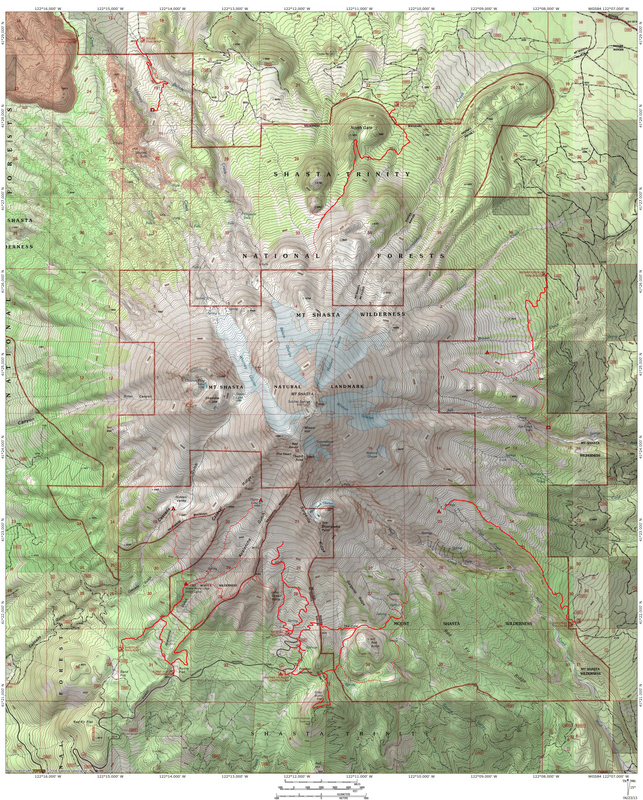 A short study of the proposed trail network, as well as corresponding topographic maps, reveals a well thought out series of routes that are both environmentally sensitive and maximizes the best features of the terrain. Wherever possible, the trails avoid dirt roads. However, when crossing ravines, gullies or small canyons, the trails briefly rejoin roads to utilize existing bridges. They then quickly dive back into undeveloped terrain. 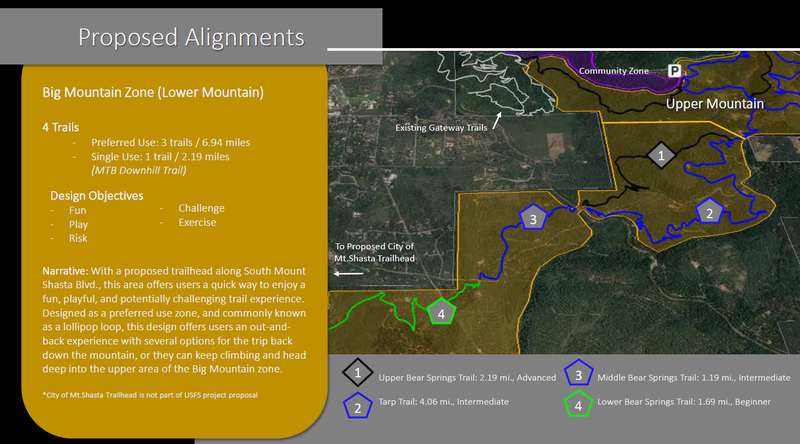 The map also reveals another excellent feature included in the project: 4 new trailheads in addition to the existing one on Everitt Memorial Highway. Three of the new ones will be higher up on the highway, at McBride Springs, Ten Gallon Plantation and at the Everitt Memorial Vista. This last is an already existing access point that is quite underutilized due to the forest overgrowth. The fourth trailhead is to be developed at the Nordic Center on the Ski Park Highway. The trails also connect to the Ski Park itself, which could also function as a trailhead. Additionally, another trailhead is planned at the south end of Mount Shasta City, near the old mill site. 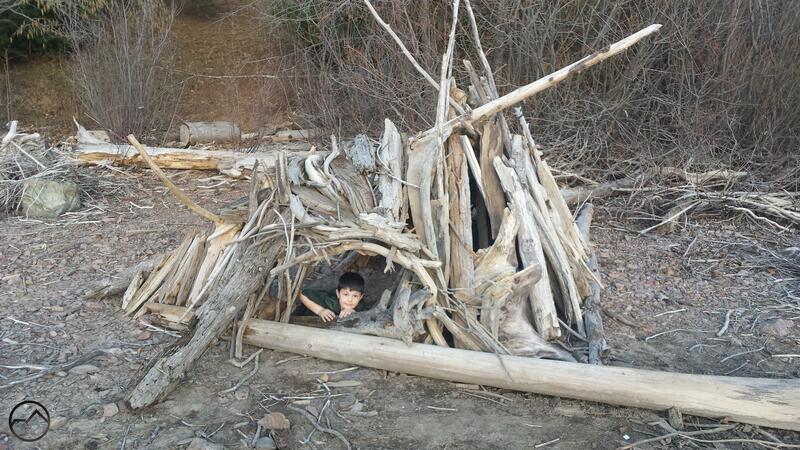 However, the this would be on city property and is, thus, not a part of the Forest Service project. Another huge feature of this plan is the expansion of the McBride Spring Campground. This site is already heavily utilized and the plan is to double or nearly triple its capacity. The planned McBride trailhead would be directly across the street from the campground and would make a fantastic basecamp from which to explore this vast trail complex. The entirety of the Phase II expansion is broken up into 3 sections (see above map). They have been dubbed the Community Zone, the Big Mountain Zone and the Learning Zone (with the possible renaming as the Discovery Center). Each of these areas has a different emphasis on use. I have broken out some of the slides from the presentation. 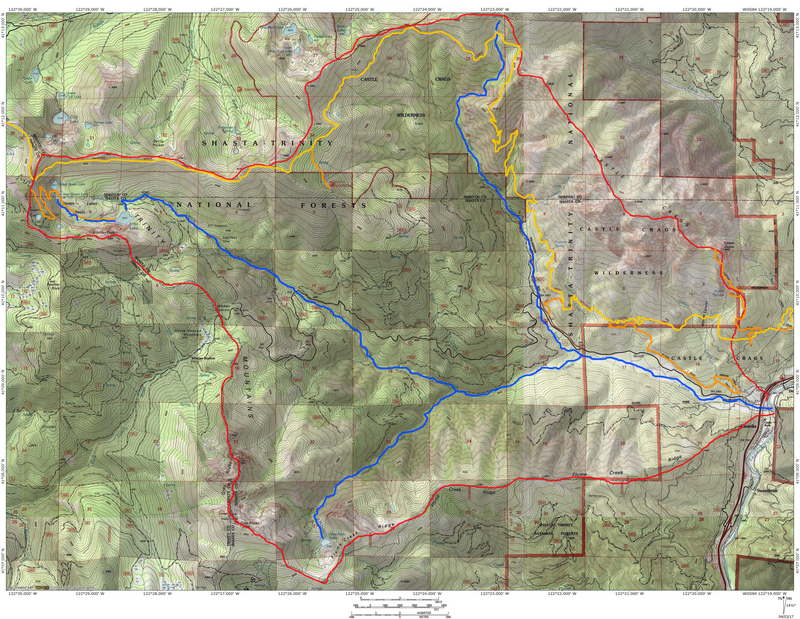 A summary of each area as well as the proposed trails are present on each. The Community Zone is so named because it is close to town but also because this is the place most likely to be used by a wide community of recreators. The anticipation is that the paths here will be used heavily by both hikers and bikers. It is, in many ways, an expansion of the already existing Gateway Trail network. This fills in a lot of unused areas and more than doubles the miles of trails available here. It also explores some interesting features like Morning Star Knoll (aka Rooster Rock) and the lower reaches of Cascade Gulch. It also has some pretty grand vistas of Mount Shasta itself. 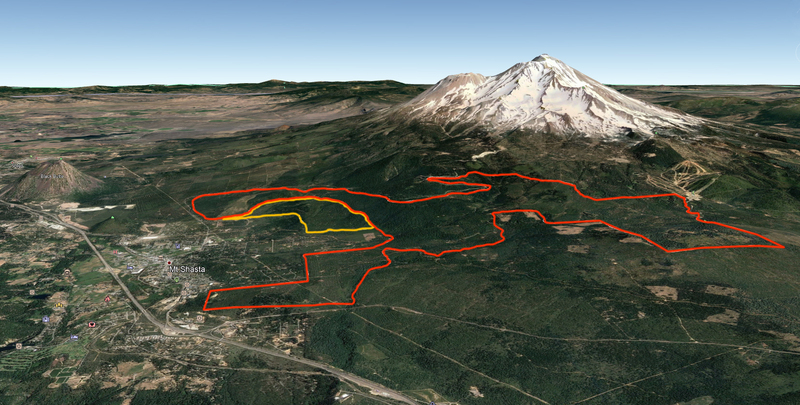 This section alone would be an incredible trail addition to the Mount Shasta area. The Big Mountain area is broken into upper and lower sections. Taken together, these areas are envisioned as the most heavily used by mountain bikers. Consequently, much of their design has this use specifically in mind. This is not to say that hikers can’t or won’t venture into this area, but there simply won’t be as much to offer that use here. The Upper section of the Big Mountain Zone would be accessed via the Everitt Memorial Vista and from the planned Ten Gallon Plantation trailhead. 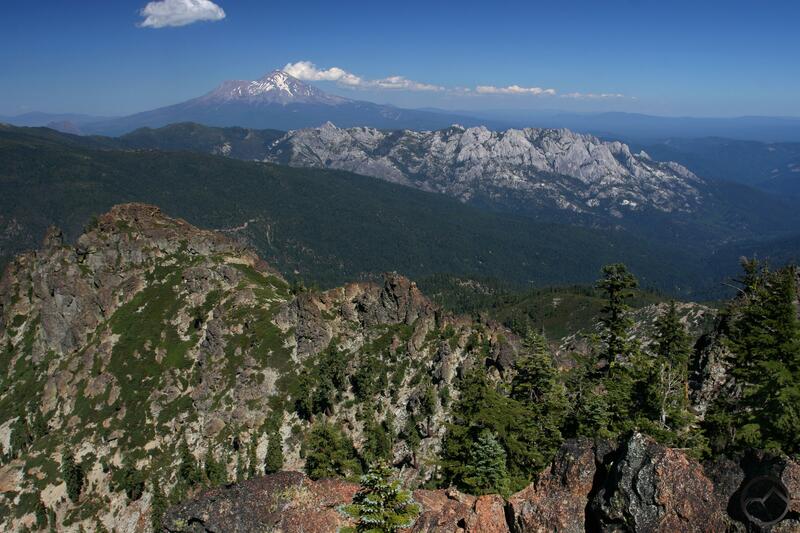 This area explores steep terrain, would have difficult trails and travels rarely visited parts of Mount Shasta. In some ways, this is the most fascinating part of the Phase II expansion. 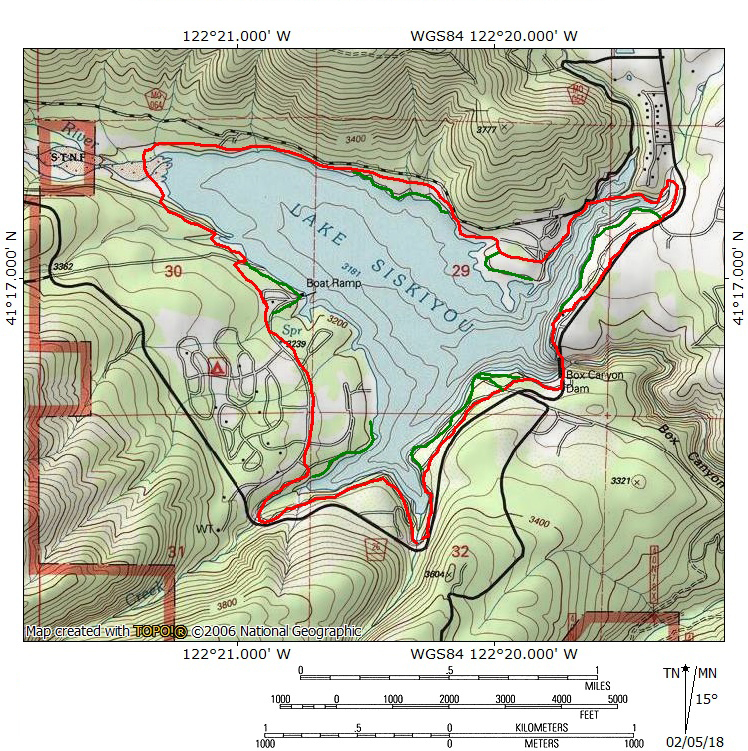 Accessed via trails in the Upper Big Mountain Zone as well as the planned trailhead at the southern end of Mount Shasta City, this is trail network would explore some pretty remote areas. The possibility of hiking or biking this as a lollipop, as well as access from the south end of town present some intriguing adventures. The final section of the Gateway Phase II expansion is the Learning Zone. This area is located just west of Ski Park Highway and around the large, rounded summit of Everitt Hill. 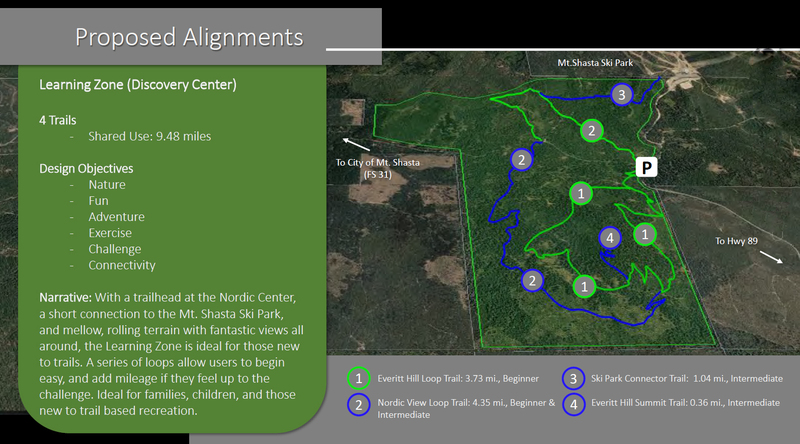 The routes basically connect the Nordic Center to a series of trails that explore the flanks and summit of the hill. Trails also connect to the nearby Ski Park. All the trails in this area are easier and are therefore lend themselves more to beginner and lower intermediate use. 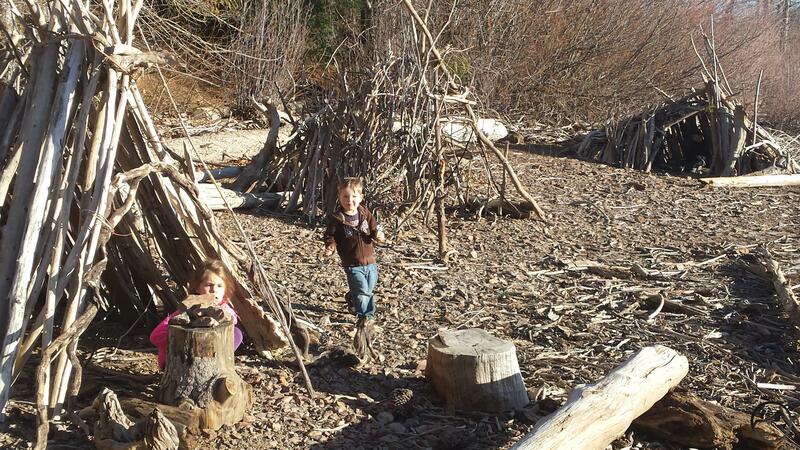 This is an area where families with small kids would thrive on the trails. Its proximity to McCloud would also be a huge asset for that community, allowing people to access the entire network from the east, rather than through Mount Shasta City. The scope and nature of this project is impressive. 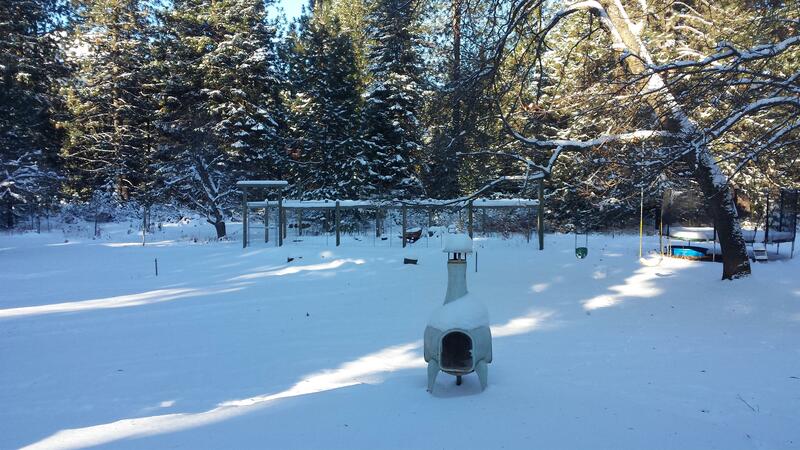 When completed, this will be an incredible resource for all of southern Siskiyou County. Although already a destination for outdoor enthusiasts, this trail network will likely significantly increase the number of people coming to this area to enjoy the recreational opportunities. 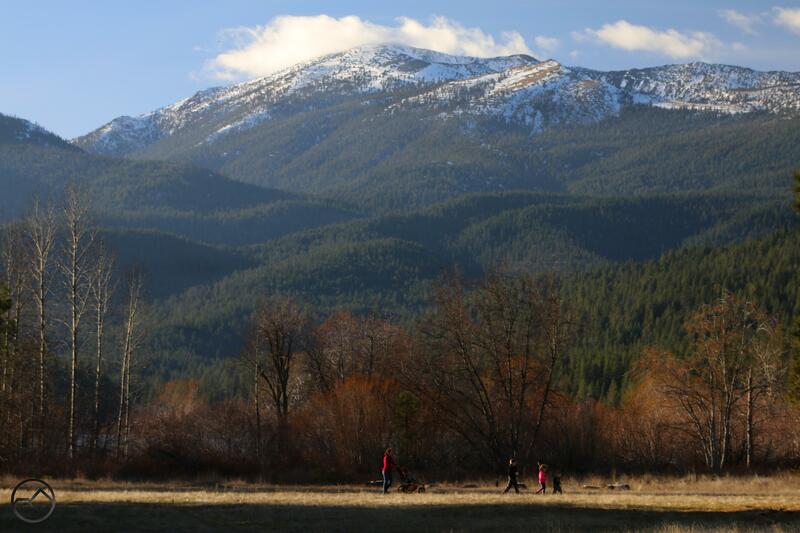 For locals, who already have an abundance of riches when it comes to trails and things to do in the outdoors, this will be an over-the-top opportunity that will change the nature of hiking and biking in Mount Shasta. It is exciting to contemplate all the possibilities. All those who have been involved in the planning are to be highly commended! So where do things stand now? It is my understanding that a significant amount of the funding has already been obtained but more most be secured going forward. For now, the Forest Service is going through the EIR and NEPA (I really dislike NEPA). This will likely take a year or so to complete. When that is done, assuming the findings are appropriate, construction of the whole network and the trailheads is expected to take 3 years. Realistically, this is likely to be done around 2022 or 2023. I imagine, though, that it is possible that one of the zones could be completed in 2 years time and folks are riding and hiking trails by sometime in 2020 (pure speculation on my part). I initially thought about including a pros & cons section in this review but, honestly, I don’t think there are any significant drawbacks to this project. What issues there are tend to be more subjective in nature. Some folks might not like the increase of people coming from out of town to enjoy the trails. Other might not like informal trails being decommissioned. 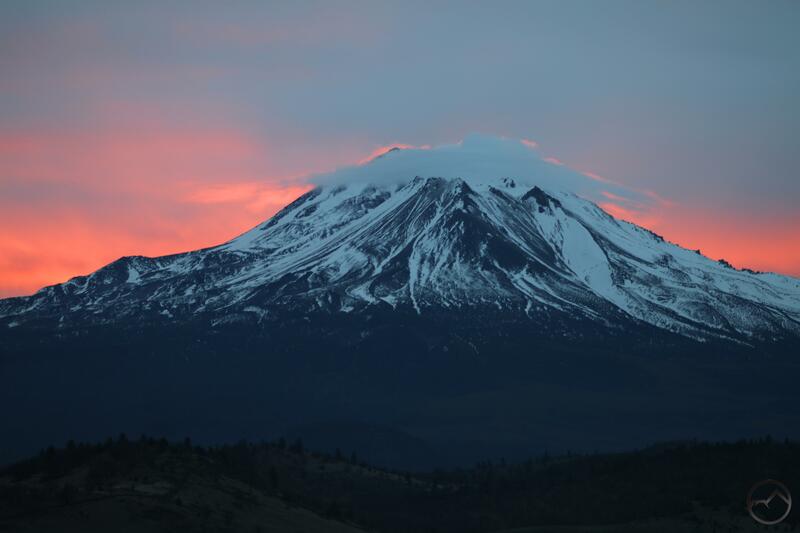 There can be complaints around numerous points of the project but overall, this is a well thought out and exciting opportunity for Mount Shasta. I, for one, am excited to explore the new trails as they are constructed. The additions to the McBride Springs Campground are essential, but I think they may not be enough. I think increasing the enlargement would be helpful. 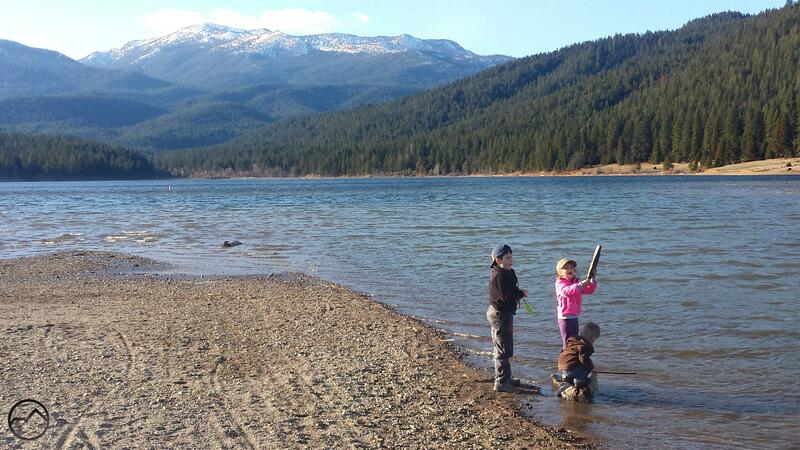 However, an even better option would be to build an all new campground a little northwest of the current campground. This would be in plantation land but could host a lot more campers. A trail could connect the campgrounds and would facilitate campers accessing the McBride trailhead across the road. As it is now, with such great access to the network, the additions to the current campground could be quickly outpaced by the number of mountain bikers wanting to camp and then hit the trail. 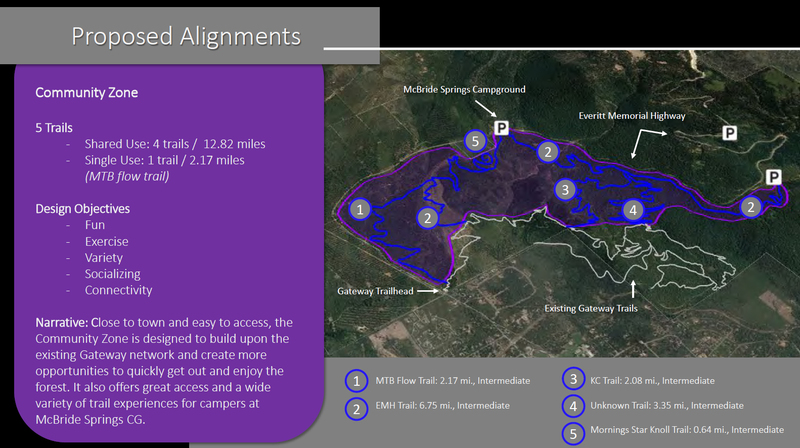 It would also be a neat feature to include one or two backcountry campgrounds. This could be placed at the upper end of the Lower Big Mountain Zone (as well as other spots) and allow mountain bikers or hikers to camp in remote areas while enjoying the trails. The lower elevation of these areas would also mean that early season overnighters would be possible right outside of town. In a similar vein, there has been some discussion of incorporating the South Sisson Trail into the Gateway Phase II expansion. This route was the original trail by which climbers would ascend from Mount Shasta City to Horse Camp and then to the summit beyond. This trail was abandoned after the construction and paving of the Everitt Memorial Highway. However, much of the trail was still extant. It remained dormant until motivated hikers have improved the trail and it can once again be hiked up to connect to the Sand Flat trailhead and then on to Horse Camp. 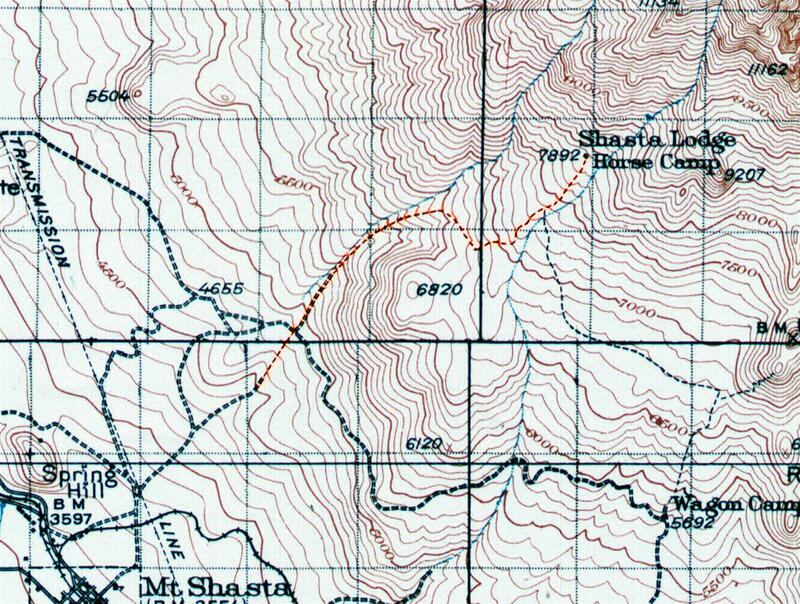 The South Sisson Trail, highlighted on the 1935 USGS topo map for Mount Shasta. 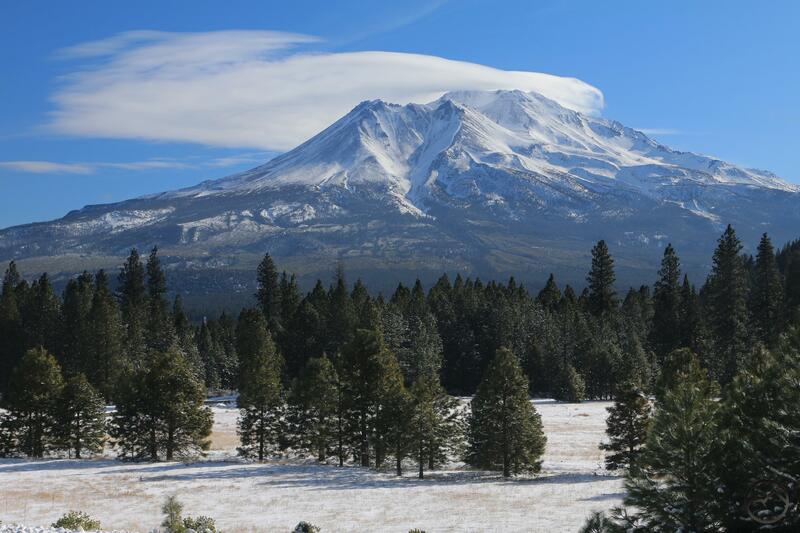 What is proposed now is including the already (unofficially) restored trail in the EIR and NEPA process and then including it in the Phase II expansion as an official part of the trail network on Mount Shasta. I am completely in favor of this. 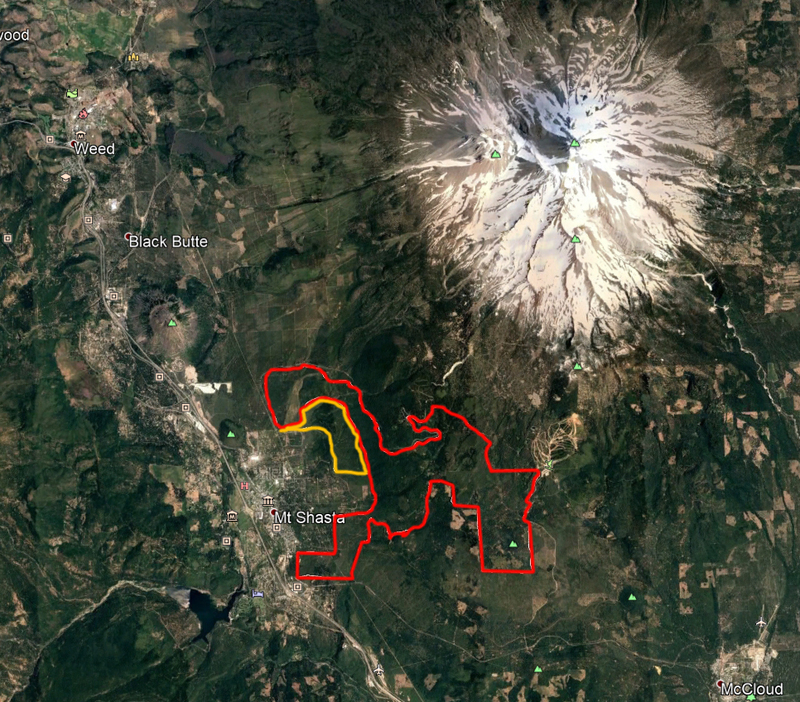 This would effectively link the entire Gateway network, as well as the town of Mount Shasta City, to many of the trails that lie high up at the treeline. My proposed (and also unofficially constructed) addition of a trail connecting Bunny Flat with the Old Ski Bowl would further link the whole area. 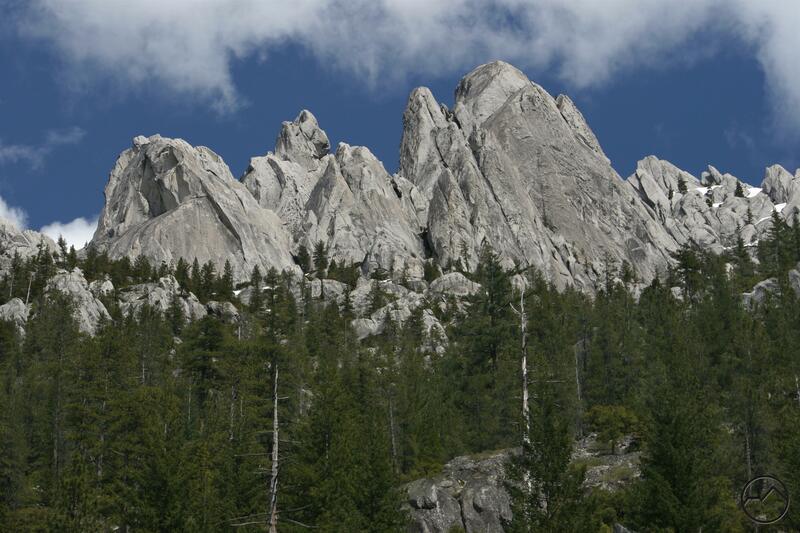 It would be an incredible set of trails, of true national park caliber scope and scenery! In summary, I think the Gateway Phase II expansion project is an incredible addition to the Mount Shasta area. It will benefit the community though an increase in tourism and will likely put the area “on the map” as far as mountain biking goes. 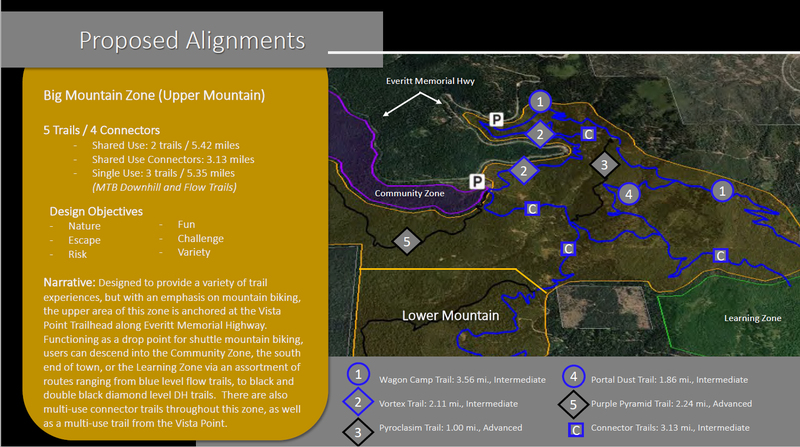 Even if no new hiker-specific trails are constructed, it will serve to shift mountain biking use off of trails like the Sisson-Callahan and McCloud River Trails and onto the Gateway network. For hikers, it still holds some excellent opportunities to enjoy the lower slopes of Mount Shasta. I am also very interested to see everyone’s thoughts on this project. Please feel free to leave comments on this review! 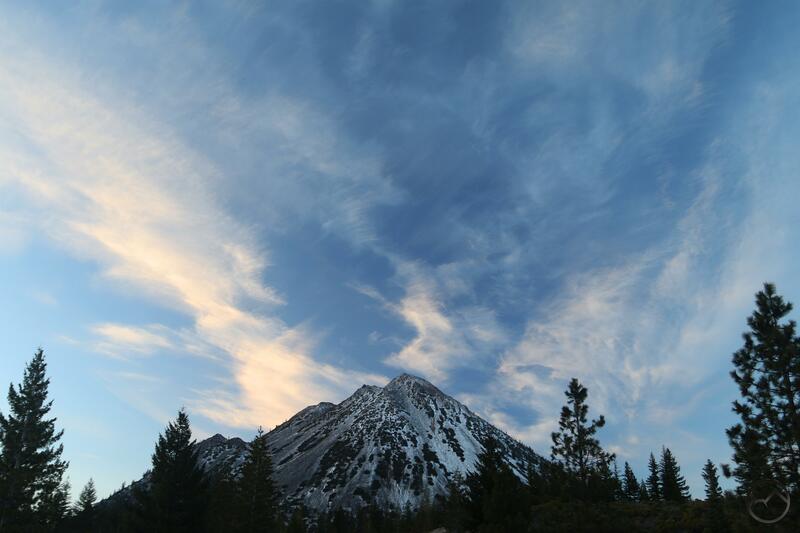 Dawn’s light illuminates the fringes of a Mount Shasta lenticular. I was up early prepping some material for a class I am teaching at church, as well as putting the finishing touches on my Gateway Trail Phase II review, when I noticed the clouds where of such a nature and position to produce a sunrise shadow. These are among my favorite phenomena. I hopped in the car and headed north, which is usually the best orientation from which to enjoy the shadows. Little did I know that the mountain also boasted a nice lenticular crown. I raced to one of my easy-to-get-to spots and and set up my camera as the morning light really began to hit the clouds. As I endured the frigid morning (the car said 23) I watched the color get more intense and light up the clouds above Mount Shasta. Soon the edges of the lenticular itself were glowing. It was a gorgeous sight, which I enjoyed in the solitude of the dawn. The lenticular began as a classic disk, but as the color intensified, it lost some of its well-defined edges as it expanded. Nonetheless, the change in shape was not disappointing as it retained a pleasing form and the summit of Mount Shasta just poked through the cloud and caught the morning light. In the midst of this, the sun finally reached a position where its light was cast at the angle necessary to create a shadow. Frustratingly, there were no clouds positioned immediately above Mount Shasta, so the shadow was not as readily observed. However, there were clouds higher up for the shadow to manifest. This, coupled with the lenticular, was an awesome sight and made for a truly beautiful morning. However, the cloud cover was thicker than ideal and the sun’s light was quickly obscured before the full sky was illuminated and the colors were lost. I was glad to have seen the fleeting event. We may not be getting much snow, but there sure has been a lot of spectacular activity around the mountain lately! 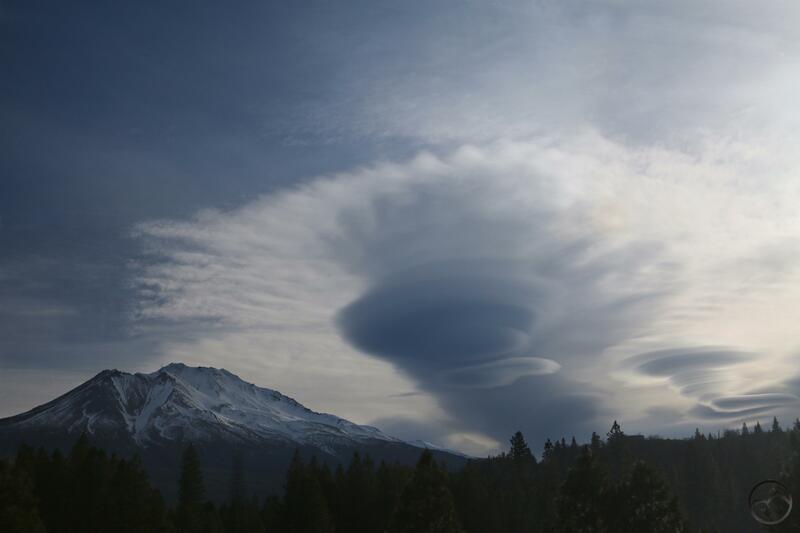 Incredible lenticular stacks form near Mount Shasta. 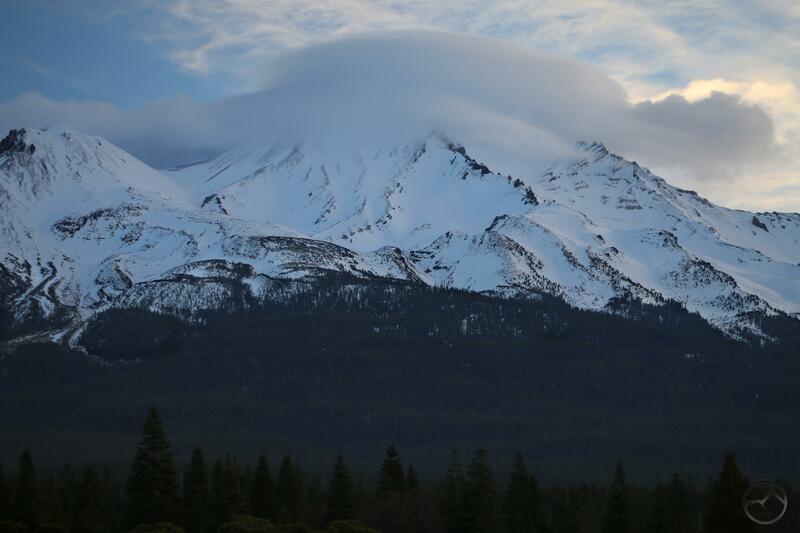 Once again, Mount Shasta was up to its tricks, disrupting changing weather systems and causing massive lenticular displays to form overhead. As the autumn and winter have unfolded, what started off as a slow lenticular season has suddenly turned in a really remarkable series of lenticular displays. Those of February 9th will certainly rate among the more exciting and elaborate collection of clouds I have seen around Mount Shasta. The form of the clouds was in constant flux but for much of the day, the disks grew in multiple stacks just south of the mountain. If there was anything to complain about in the midst of such a singular and staggering display it was that the lenticulars cast their shadow on Mount Shasta, rendering the mountain dark amidst harsh, glaring light. Nonetheless, the spectacular nature of the clouds demanded I stop numerous times during the day to capture their awesome nature. I have two lengthy posts in the works, so I will keep this one short and put up the pictures. I think they speak for themselves. Early in the day, the clouds were already awesome. As the sun set, the single cloud above the summit still exhibited minor lenticular traits. Alpenglow and the final, fluctuating form. 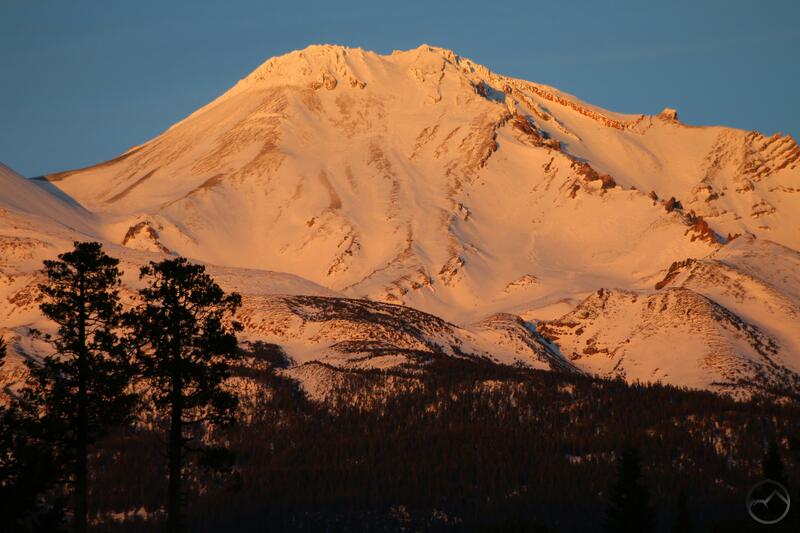 A beautiful sunset on Mount Shasta.